What will Zion Williamson's NBA position be? Which freshman is a sneaky one-and-done candidate? We answer those 2019 NBA draft questions and more. The summer is long…but the offseason isn’t actually that long. The Crossover’s Front Office returns from a brief hiatus to answer nine big questions surrounding the 2019 draft. 1. Isn’t it too early to talk about next year’s draft? Well, not anymore. True, it’s only August, but the scouting calendar for 2019 has begun in earnest. There are a slew of elite sneaker-sponsored showcases taking place this month, with the CP3 Elite Guard Camp having just wrapped and both the SC30 Select Camp and the Nike Basketball Academy tipping off this week. Scouts are back on the road looking at high school and college players, teams are back on campus and Kentucky will play four exhibition games in the Bahamas in the coming days. Yep, basketball season is creeping closer. Thankfully, there are still a couple months left before things get crazy, but there’s enough going on to throw our anticipatory guilt out the window. So let’s talk a little more about the 2019 draft. For added context before we get going, our offseason Top 60 Big Board can be found here. 2. Does Duke’s big three actually make sense together? The better question at this point probably centers on when everyone will get tired of talking about this Duke team, but I digress. We’ve already written about the possibilities in terms of fit between lottery-caliber, ball-dominant freshmen R.J. Barrett (presently No. 1 on our board), Cam Reddish (No. 2) and Zion Williamson (No. 5). It will remain a hot topic until they prove it can work. That’s not to say it can’t, but establishing a pecking order is generally challenging, and this is not a Blue Devils roster that returns much in the way of experience or talent. There’s also freshman point guard Tre Jones, who will have to be a quick study, but keep in mind that this was not a particularly deep freshman class to begin with. As we’ve seen with some past Duke teams (the Jabari Parker/Rodney Hood/Rasheed Sulaimon squad comes to mind), too many scorers and not enough of everything else can lead to some team-wide issues, regardless of how good your best players are. 3. 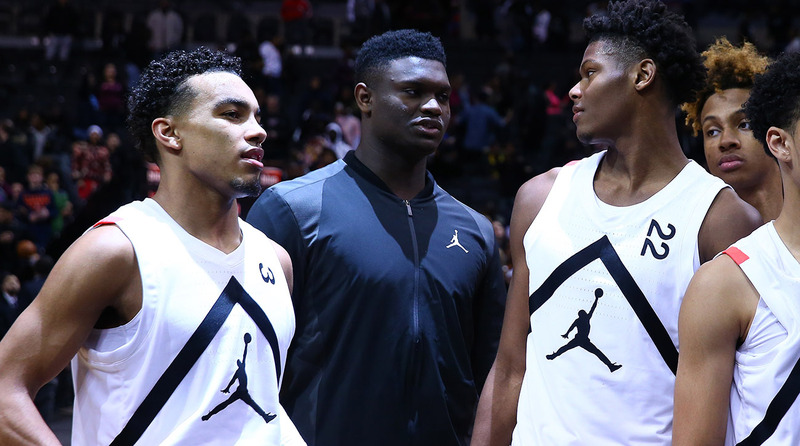 What position will Zion Williamson play in the NBA? There was a small-scale tremor on the internet last week when word trickled out that Duke officially listed Williamson at 6’7” and 285 pounds. This isn’t all that shocking if you’ve seen him in person, but it makes his aerodynamic prowess that much more impressive. There’s never been a prospect quite like Williamson, with his rare blend of strength and power and an undersold amount of ball skills and feel. The central question is exactly what elements of his game are going to translate, particularly given that he’s a poor jump shooter. He’ll get away with some things at the college level by bullying defenders, but it’s still not clear what role he’ll best fit into as a pro. One quality point of comparison is Julius Randle, who’s a bit taller but had some similar strengths at the same stage of his development. Williamson could end up as a faceup four-man in a similar vein, although it’s possible he never gets to the point where he can be classified as a stretch big. He might be a bit too hefty to defend NBA small forwards and better off sliding down onto taller players. The optimal scenario might be Williamson as a small-ball big surrounded by shooters, with his explosiveness and instincts helping compensate for his lack of size. In high school, he played on the ball a lot and took over games with his athletic gifts, but if Duke can develop him into a more interior-focused player, it may benefit Williamson long term. The dunks will be great regardless. 4. Who are the top international prospects in the class? The early hype has centered on two prodigious European forwards: French scorer Sekou Doumbouya and versatile Croatian big man Luka Samanic. Both players made the trip to Basketball Without Borders Global Camp in February, where they looked the part as high-end talents with substantial NBA upside. Doumbouya is presently the No. 4 prospect on our board, with Samanic further back at No. 10. An extremely athletic forward who can score from outside or off the drive, Doumbouya doesn’t even turn 18 until December and could be a dark horse to go very high in the 2019 draft if he has a big year playing for Limoges in France. He might be able to play either forward position long-term as his body and skill set develops, and has a great base set of skills for a modern scorer. The age factor will also play in his favor: for point of comparison, he’s six months younger than R.J. Barrett and 15 months younger than Cam Reddish. He’s a very safe bet to be drafted somewhere in the lottery at minimum, and potentially a big mover over the course of the season, given how thin this draft class is at the top. Samanic has a ton of skill wrapped into a legit 6’10” frame. Due to the malleability of his game, he’s still working out what type of player he’s going to be. He has legitimate inside-out game, some point forward skills and outstanding feel as a passer. Samanic has starred for Croatia’s junior teams and can do a bit of everything, possessing good fluidity of movement though not an eye-popping athlete. He should see more playing time this season after leaving Barcelona for Olimpija in Slovenia, and also has a shot at the lottery with a strong year. As positionally-similar European big men go, the hope would be that Samanic falls closer to Dario Saric than Dragan Bender. 5. Which freshman is the sneakiest one-and-done candidate? One player who’s generated some buzz in NBA circles is incoming USC shooting guard Kevin Porter Jr., who clocked in at No. 18 on our off-season Big Board. That position could end up looking a bit rich, or it could be underselling Porter’s ability to score the ball on the wing. A creative, lefthanded shooter and athletic standout, the Seattle native will see plenty of touches and have a big opportunity to leave a mark this season. ‘Sneaky’ is relative (and fleeting), but for a guy who wasn’t a McDonald’s or Jordan Brand All-American, Porter looks to be trending in the right direction. 6. Which obvious one-and-done candidate might be overhyped? 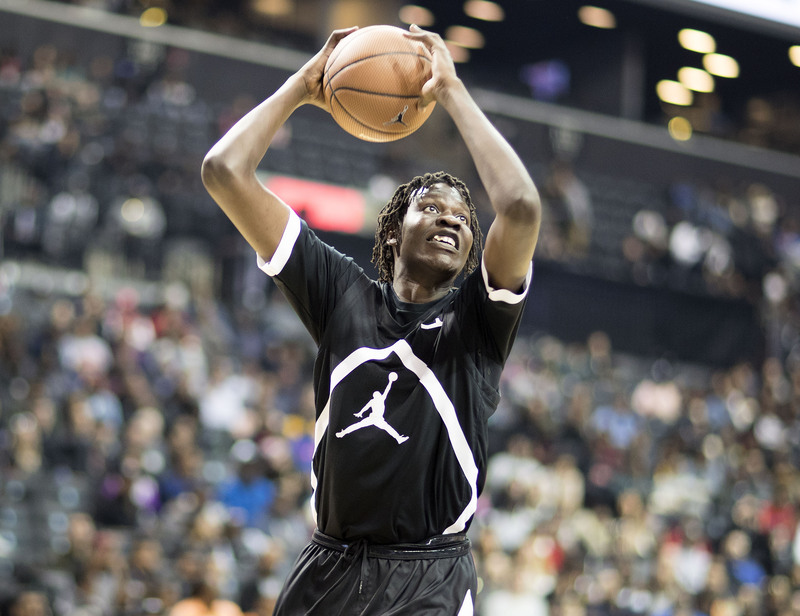 It’s advisable to wait-and-see before crowning incoming Oregon center Bol Bol, whose name brand and YouTube highlights have preceded him over the last couple of years. After scouting him a few times in person over the past eight months or so, consider me more of a skeptic, as are many scouts around the league. The primary thing Bol has going for him is his height and length, but as always it comes down to what translates—at this stage, it’s hard to be overly confident. While he can affect and alter opponents’ shots simply by being tall, the want factor that’s crucial with bigs is rarely there with him, and it will be increasingly difficult for him to be productive by relying on his tools as opponents get bigger and stronger. Bol can shoot from outside with his feet set, but a low release point leaves him prone to being blocked or downright erased when defenders play up on him. His preference for floating on the perimeter helps hide an interior game that’s somewhat underdeveloped. It’s certainly possible someone takes a flier on him in the lottery, but there’s also a chance Bol struggles to live up to the hype. He’s No. 21 on our board for now. 7. Who are the best point guard prospects in the country? There aren’t a ton of high-end lead guards in this draft class, but there are a range of ball-handlers who could break out and wind up in a desirable spot come draft night. Kansas freshman combo guard Quentin Grimes and Vanderbilt freshman Darius Garland are two of the more intriguing backcourt players from a pro perspective. As far as returners go, Purdue’s Carsen Edwards, Boston College’s Ky Bowman and Iowa State’s Lindell Wigginton will continue to receive extensive NBA looks after testing the waters and staying in school, although none are surefire first-rounders. Don’t hold out for a repeat of the guard depth we saw in 2018, with guys like Jalen Brunson, Bruce Brown, Jevon Carter and De'Anthony Melton falling into the second round. One of my personal favorite prospects is Florida freshman Andrew Nembhard, who should be ready to start for the Gators on day one and may not be around long if things go well. As always, players will emerge. 8. Which mid-major player has the best chance to go in the lottery? This is kind of cheating to the extent that Western Kentucky is a true mid-major in Conference USA, but Charles Bassey could have helped any college team in the country and will anchor the Hilltoppers instead. It’s sort of cheating and definitely obvious, but he’s got first-round tools and enough of a reputation coming in that he should be able to crack the lottery with a productive year. No, I don’t consider Gonzaga a mid-major program. 9. Which under-the-radar sophomores could break out? Five sophomores who have piqued my interest this summer: sharpshooting Gonzaga guard Zach Norvell, athletic Texas big Jericho Sims, Wake Forest’s 7-foot French import Olivier Sarr, Florida State forward Mfiondu Kabengele and versatile Arizona wing Emmanuel Akot. Also look out for Murray State guard Ja Morant, whose athleticism and impressive freshman-year production is worth tracking closely.